Intestinal cells in both insects and mammals respond to beneficial bacteria by turning on the Nrf2 pathway. 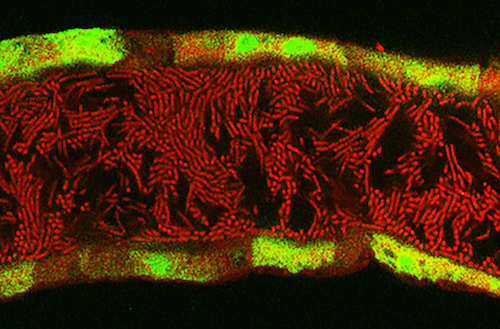 Drosophila intestine with lactobacilli bacteria in red. The green fluorescent tissue on the edges is a sign of the upregulation of Nrf2-responsive cytoprotection genes. Courtesy of Rheinallt Jones. Scientists at Emory University School of Medicine have shown how an ancient cellular regulatory circuit called Nrf2, present in both insects and mammals, responds to beneficial bacteria and gears up a protective response to environmental stresses. The findings could potentially lead to advances in the use of bacteria to treat intestinal diseases or mitigate the effects of radiation therapy for cancer. The results were published Thursday, August 13 by Cell Reports. While many types of bacteria that live in our intestines are inert or even harmful to intestinal cells, a small subset – lactobacilli – can stimulate increased motility, proliferation and ability to withstand stress, Neish says. “Lactobacilli are present in yogurt, and they’re also the first kind of bacteria that will colonize a baby’s system after the baby is born,” he says. Working with Neish, assistant professor of pediatrics Rheinallt Jones, PhD and colleagues found that only lactobacilli could protect previously “germ free” fruit flies from paraquat, a toxic herbicide. Similarly, feeding lactobacilli, but not other types of bacteria, to germ-free mice could protect them from weight loss and death after exposure to radiation. To facilitate this type of research, Jones is establishing a gnotobiotic animal facility at Emory, which will enable scientists to investigate what happens when an animal’s intestines are colonized with only one variety of bacteria.